This is a prime lens manufactured by Nikon and the model was launched 2008. The lens belongs to the category wide angle prime lenses, a wide angle lens where you do not have the possibility to zoom in and out. 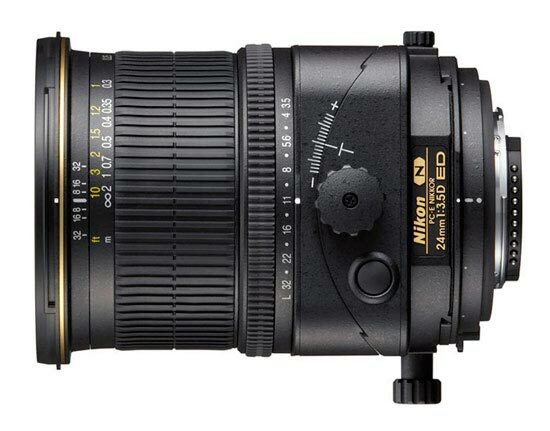 This lens is constructed to fit all models of Nikon cameras, regardless of camera model or type of sensor. The lens has a focal length of 24 mm. Depending on which camera the lens is used, the experienced and perceived focal length will be different. Please visit the list of compatible cameras below, it will provide the equivalent focal length you get on each camera. The lens brightness and aperture value is f/3,5. If you buy this lens it will come with a lens hood, whose model name is "HB-41". Text from Nikon: "This ultra-wide lens with perspective control features tilt, shift and rotation capability, perfect for architectural, nature and commercial photography. Ultra-wide, Perspective Control (PC) lens featuring tilt, shift and rotation capability, perfect for architectural and nature photography. Revolving capability of plus or minus 90-degrees, in 30-degree increments, for versatile tilt/shift shooting effects. Three aspherical elements virtually eliminate coma and other types of lens aberration even at the widest aperture. Three ED (Extra-low Dispersion) glass elements offer superior sharpness and color correction by effectively minimizing chromatic aberration. Nikon´s Nano Crystal Coat virtually eliminates internal reflections across a wide range of wavelengths, for even greater image clarity. Rounded 9-blade diaphragm for more natural appearance of out-of-focus image elements."